Bryan Ferry's sixth solo album and his first album after the demise of Roxy Music. The album was his first solo number 1 album and was released in 1985. The first single, Slave To Love was used extensively throughout the film 9 1/2 weeks and reached number 10 in UK. The follow up single Don't Stop The Dance peaked at 21 and the Windswept EP which included some unused tracks from The Bride Stripped Bare sessions reached number 46. The album had several release dates as the making of the album took longer than expected. 30 musicians and 7 studios were employed to complete what Bryan described as his 'Meisterwerk'. Bryan was offered the Keith Forsey song Don't You (Forget About Me) to record for the film The Breakfast Club but due to being behind schedule with this album he declined the offer. Simple Minds went on to record the song which gave them their breakthrough in USA. The album's sleeve featuring a freeze frame of young couple in an embrace had altenative shots from the same sessions in UK and USA. The Bryan Ferry & Roxy Music back catalouge was released on CD for the first time on E'G in 1984. 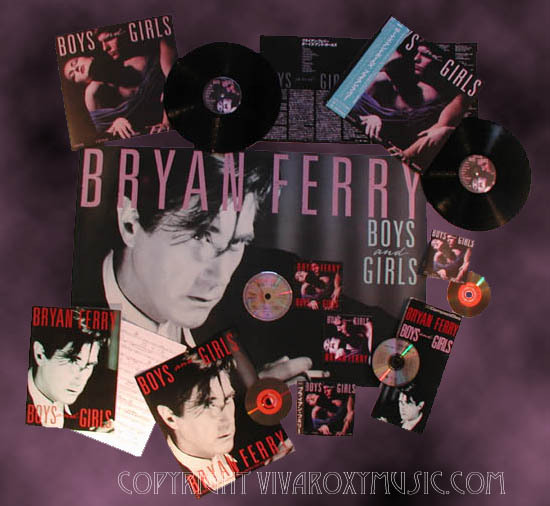 Boys & Girls was the first album of new material by Bryan or Roxy to be released on CD on its release date. This album is dedicated to his father Frederick Charles Ferry who died during the making of this album. Slave To Love (Single Version) A shorter version used for the 7" single. Slave To Love (12") An extended version found on the 12" single. Slave To Love (Instrumental) This instrumental version was on the 12" single. Don't Stop The Dance (Single Version) A remixed version for the 7" release. Don't Stop The Dance (Special 12 Extended version for the 12" single. Don't Stop The Dance (Instrumental) An instrumental version found on the 12" single. Nocturne An instrumental written by Bryan Ferry and used as the b-side to Don't Stop The Dance. Crazy Love The b-side to the 'Windswept' single. Is Your Love Strong Enough? (Full Version) An extended version for the 12" single. Windswept (Instrumental) Used as the b-side to the 'Is Your Love Strong Enough?' single.